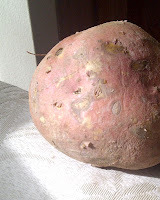 The Southern Vegetarian Chronicles: Louisiana Sweet Potatoes and the Local Foods Revolution! Louisiana Sweet Potatoes and the Local Foods Revolution! Recently I began to teach classes on something I call "Your Food Lifestyle". It's a unique class that presents an opportunity to become more in tune with what you eat daily and not focus on a specific diet. One of the first assignments I gave my class attendees was to check out their local Farmers Market. I told them to talk to the farmers; taste and smell the food. For me, preparing food is an experience, not a chore and if we know where our food comes from, we can feel more connected to it in a positive way. This morning, I found an article on the popularity of the local foods movement and it's sales. Check it out below and let me know what you think! Do you buy local foods? What's your opinion on the whole movement? Also, I wanted to let everyone know that there is an abundance of sweet potatoes now in Louisiana so I've been experimenting with various seasonings and roastng them. Here are two seasoning ideas I found tasty. Put potatoes in bowl and coat thoroughly. roast for 20 to 30 mins until soft.